Almost everyone has felt anxiety and uncertainty over a friendship. Sophie is looking forward to her first sleepover. She is excited from the tops of her ears to the tips of her toes and has even made a list of all the things she wants to bring over to her best friend Olive's house. But, when she arrives, a bunny she's never seen before opens the door. In this heartwarming tale of first sleepovers, furry animals, and friendship, Marisabina Russo asks the age-old question: can one bunny have two best friends? Marisabina Russo is the acclaimed author/illustrator of numerous books for young readers including The Line Up Book, I Will Come Back for You, The Bunnies Are Not In Their Beds, and A Very Big Bunny. 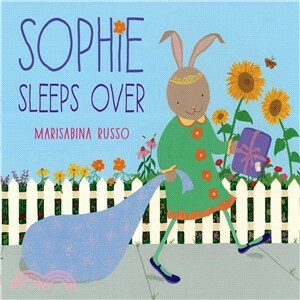 Sophie Sleeps Over is her first book with Roaring Brook Press. Ms. Russo lives in Westchester, New York.